I always start every post with a quote and for today, in this letter to you, this quote feels right in my heart. Although we are even further than 1,000 miles away, there will always be a cup at our table for you. While we have not formally met, I am your son’s wife, your daughter-in-law, and the mother of your precious grandbabies Q and E.
You name often rings through our home in the form of “Quinn Ellis Pruitt!” It hangs on his wall on a pale blue canvas bearing his name and date of birth. You are present, you are with us, but you are not “here,” so I thought that it was time to share with you what has been happening in the past 8 years since you crossed over into heaven to watch over us. Your son, your amazing son, has become a man. As you know, I came into his life 2 years after you passed and to say he was still missing and struggling with losing you would not cover the pain that sat in his heart. I am so very lucky to not have experienced losing one of my parents (knock on all things wood) and so the only form of comfort I could give him, even 2 years later, was to simply listen when the occasion would arise that he would want to talk about the experience. Being with you those final weeks gave him a very amazing gift to take with him. After you passed, there were more special memories given to him. He loves to tell the story of the young man that approached him at your funeral and shared with him the experience of you mentoring him. KSP had never heard you speak of this young man, making it even more special for him, for it seems your gifts to your family and friends often went uncelebrated and even unknown. Your son has become this man as well. He is generous and kind. He is one of the most intelligent people I have ever known and his abilities to piece things together is likely partly a gift given to him by you, with your engineering mind. He cares for the people he loves with a fierce loyalty and has a soft heart that melts at touching stories and even a commercial or two (shhh, don’t tell him I told you). His last 8 years have brought several moments where he has missed you and I have wished I could have known you. Our wedding day was not the same without you. As KSP slipped on your cufflinks, I know in his heart there was a hole that could have only been filled by your physical presence. 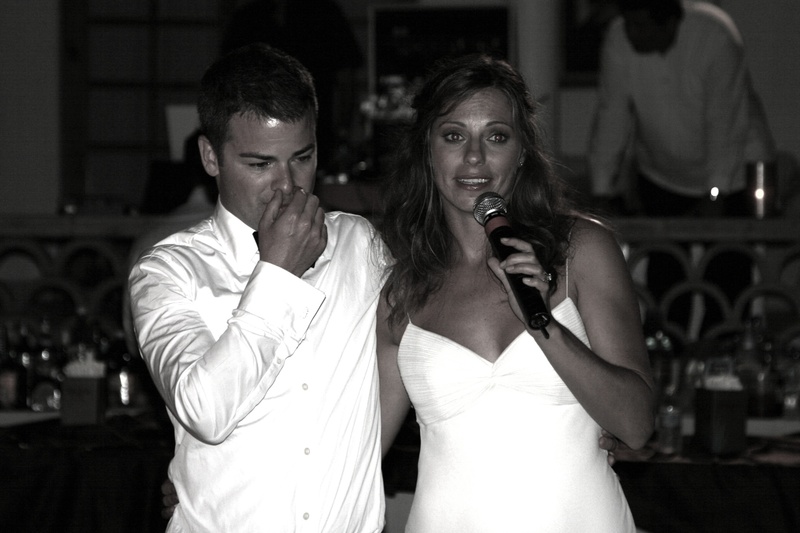 In this photo, you will notice I am giving the toast at our wedding. It was clear that since part of our goal in our toast was to share the folks we were missing that day, KSP could not bring himself to speak, as to say that you weren’t there aloud, was too much. So, it was me that said we missed you, and in that moment my heart cracked for my new husband as both my dad and mom looked on. 2 years later, as you know, we had Q and E. There was never a question that if we had a boy, he would carry your name in some fashion. You live on in your incredible grandbabies. Q with his brilliant mind and desire to build. His smile and tender heart. E, who looks so much like your son, and lights up the room with her radiance and her amazing strength and fortitude. Here is where I thank you. I know you have been with us through all these steps. I know Q and E know you in a way we cannot. I know you sat by their incubators and watched over them while we couldn’t be there. Pushing them through, taking care of them, and helping others help them when needed. I know you were in the nursery with my grandma and grandpa that night where we came so close to losing E again just after she came home. One of the tribe of guardian angels that watches over them. I remember running into her room that night at 3 am, completely flustered and overwhelmed by the heat and fear, but I also remember feeling a presence. I knew that there were guardian angels with them that night, there were so many things that under normal circumstances would have been different, but those things didn’t happen that night and E made it, yet again. And now, 2 years later, we can finally spend time with you, where you rest. 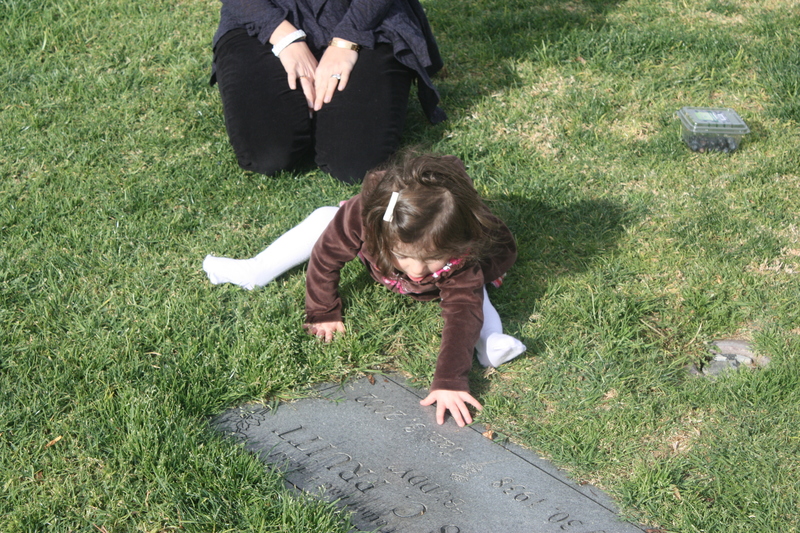 In our recent visit, I watched as E, with no prompting scooted forward to touch your headstone as if she was drawn to you by a force we could not see or feel. I watched as KSP looked on in awe, sadness and joy. I held Q as we lay quietly in the grass watching the white clouds floating overhead and pointed up showing him where grandpa was now. We were at your table. It was peaceful and quiet and perfect for a family reunion. Most recently, your son has started a new job. After 13 years at the same company, he took a leap. To see his renewed sense of fulfillment and excitement makes me surge with pride and I know you feel the same. We ofen joke that he has gone from scrambled eggs which he know how to make so well, to fried eggs that he doesn’t really know how to make without the yolk breaking but will keep pushing until he makes it perfect. You and B, raised an amazing son, husband and now father, so for that I thank you. 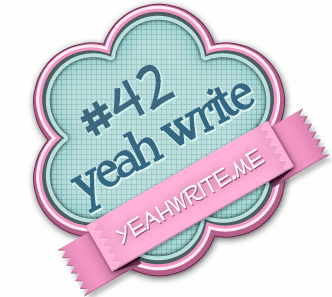 I linked up with Yeahwrite this week! If you are interested pop on over and visit some other great blogs! Thanks you Eric…you are so nice. Visiting from Yeah Write. This post made me cry. Such a beautiful letter to your father-in-law. My heart goes out to you and your husband. Simply beautiful. Thanks for sharing. Thank you so much Abby. 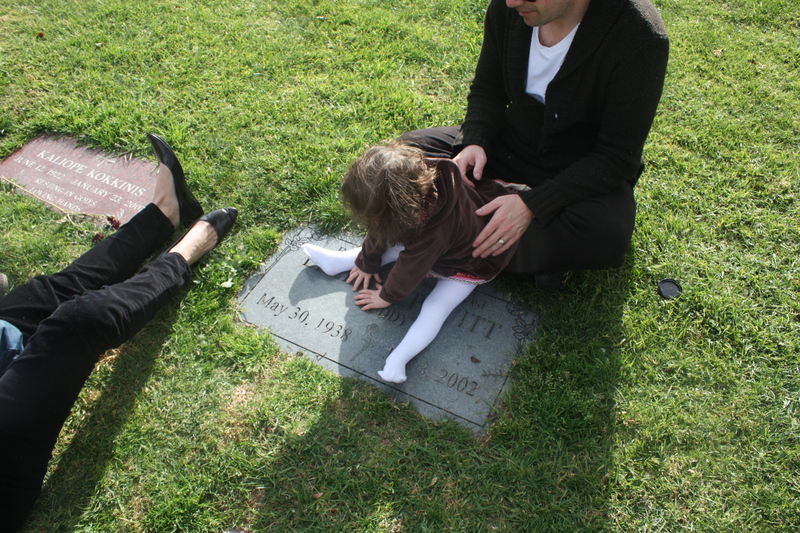 It’s been 8 years but somehow I am not sure there is any amount of time that takes that sense of loss away. You are so lovely to come by and comment, I will scoot over to see you in a bit too! Tears fill my eyes as I write this. However, they are not tears of sadness; they are tears of joy for Ellis. His son was blessed with a wonderful partner to share his life with, and there are few other gifts a parent truly wishes for their child. I’m certain Eliis is filled with joy, today and everyday. Such a beautiful letter, Shannon. Your comments always make me teary! In the best way, where you smile because they are filled with genuine kindness. Thank you. I am not always the best, but I try to do right by my KSP. I know Ellis is happy for our little family…I wish he could be with us at times as I know how much KSP misses him but such is the circle of life and we will have to do our best to keep him with us. Xo thank you. This is so sweet. What a lovely tribute. You touched my heart. I lost someone very dear to me. 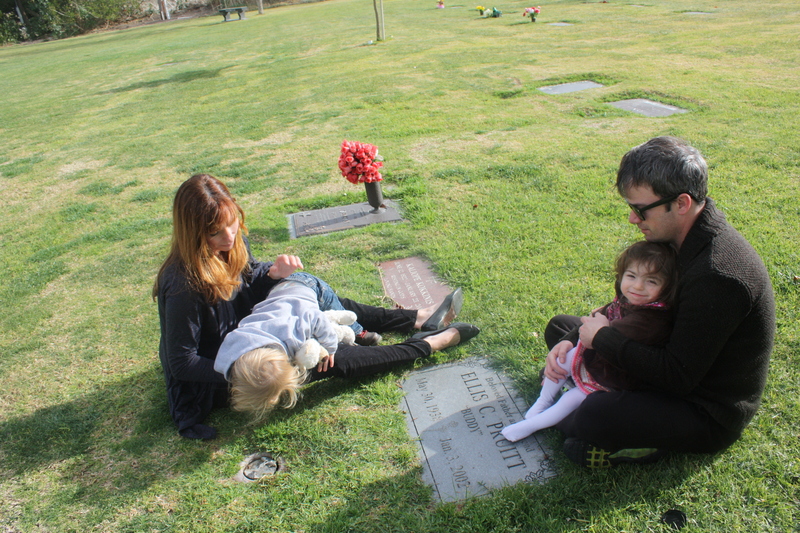 When my sons were young we went to the cemetery to visit and I’d share our special stories while we had a picnic in the grass with my friend. 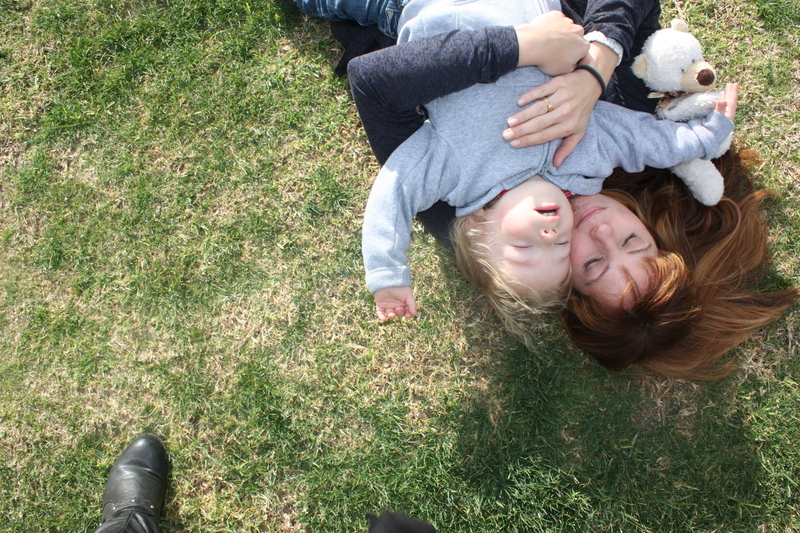 As toddlers they wobbled, ran and feel down in the beautifully tended grass. As they got older I took them there to learn how to ride a bike. I know she was cheering them on. We brought flowers, balloons, and homemade cards for her each time we visited. It was my way to share the wonders of my children with her. My children aren’t intimidated by cemeteries because they grew up with the joy of having this special guardian angel watching over us and through my stories they know and love her. She lives on in our hearts and I will miss her all the days of my life. Oh my goodness Anita, I am in tears. This is so beautiful and although we are in the wobbly toddler phase, I want to model what you have shared here. It’s amazing and a gift to me for thoughts about how to keep that bond alive. I am sorry for your loss and clearly she still holds a huge piece of your heart. What a special gift you give her and your children by allowing them to just be together. Thank you, my heart hurts a little and I have tears in my eyes, thank you for your amazing story and beautiful words. Thank you Audrey! You are so sweet and I am so blessed to have friends like you and to share your thoughts here is so special to me. I am glad you got your moment to feel and appreciate and thank you for your beautiful smiles, we all appreciate them! This was absolutely beautiful. I teared up 5 times! So heartfelt. I thoroughly enjoyed reading this. Oh goodness, this is just beautiful. What a wonderful tribute…it brought tears to my eyes and a lump in my throat. Thanks so much Jen! You are so sweet to leave such a lovely comment. I really appreciate it. This is very sweet… I bet he can read it from the other side. Thank you Elizabeth, I think and hope he can too. Shannon, this was absolutely lovely!.. We all have different reactions and thoughts when people pass and we all do what we need to do to cope and keep going forward. I can appreciate that everyone has different thoughts on the “circle of live” and it’s nice that people do as it makes for an interesting conversation. Thank you for your kind words, I appreciate your stopping by. I’m crying on the train. This is incredibly beautiful. Thanks Katy…I am sorry you are crying! But I love that you shared it. xoxo my friend. That was so beautiful. My husband’s father died a couple of years before he met me and it breaks my heart when I see him struggle. Thanks so much Kim. You can probably relate to the strange feeling as well. To have had someone be one of the most important people in your husband’s life and yet you will never know him. Thanks for coming by and for your kind words. My goodness, this is beautiful. Print and frame it. It belongs on your wall. Thanks so much Karyn…it’s such a great idea and I am going to do that. This is beautiful and heartbreaking all at the same time. Thank you Andrea…you are so nice leave your kind thoughts. It does belong framed on your wall. What a beautiful gift you are to him. Aww thanks so much Ado. Your kind words made my day. I hope I can continue to be a gift to them just as much as they are to me. I hope your husband reads this. But not when he’s around anyone he’d be embarrassed to cry around. A beautiful tribute to someone who sounds like an amazing man. Thank you Jay….yes, I think he was. And lucky for me the apple doesn’t fall far from the tree! Wonderful letter – I’m sure he’s reading this somewhere, glad that his son is happy and enjoying life. No doubt he lives on in his gorgeous grandchildren. Thank you! Yes, I agree, I think he is quite proud and our minis keep him a live here every day! you rule and I am not just saying that because of Valentine’s Day…Our pops would have been so proud you as a mom, wife and daughter-in-law. You found my blog:) Thank you…this means a lot to me.